Brighton Anti-Fascists gathered along the seafront to oppose any fascist using the cover of “Brighton and Hove Strong” to find five youngsters and one older man (three score years and ten, at least) all of whom denied having anything to do with the EDL. The six said they would let anti-fascists know if any EDL turned up. None did. Or, if they did, they hid. 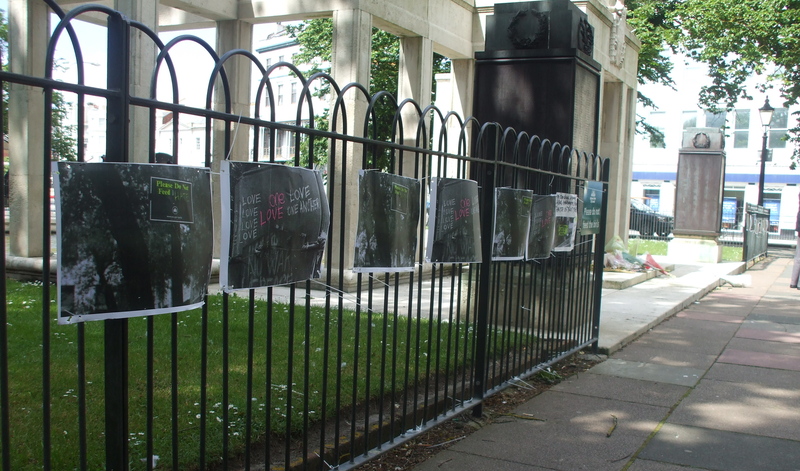 Meanwhile, an installation of anti-war photographs at Brighton’s Old Steine Memorial War was ripped down by community police officers. Entitled “Hate is not the answer”, the photographs displayed anti-war messages created New Yorkers in the days following 9/11. Maybe the cops think hate is OK. It keeps them in business. At the end of the day anti-fascists offered support to the banner-making project at Brighton’s Jubliee Library, Re-making Picasso’s Guernica. Art V Fascism: art wins hands down. Posted on June 23, 2013, in Uncategorized. Bookmark the permalink. 1 Comment.